if I have a profile for the wrestler on Joshi City, you can click on their name above to go right to it. They have that commentary box during the matches that annoys me to no end, but I am going to watch this anyway and try not to complain about it. This is the traditional “veteran vs. rookie” opener, just in this case the rookie is only 19 and yet is a ten year veteran and the champion of Gatoh Move. Mitsuru debuted on October 4th, 2016 and is yet to pick up a win in her career. That won’t change here, but she gets a chance to impress against the champ. Mitsuru and Riho trade holds to start, elbows by Mitsuru but Riho elbows her back and throws down Mitsuru by the hair. Riho goes for a camel clutch but Mitsuru gets out of it, she goes for one of her own but Riho reverses it. Riho applies a bodyscissors but Mitsuru gets out of it, they trade kneelocks until Mitsuru applies a Muta Lock. Mitsuru then puts Riho in a stretch hold but Riho comes back with a jumping knee in the corner. Riho applies her own stretch hold, she lets go after a moment and goes for a crab hold, but Mitsuru grabs the ropes. Elbows by Mitsuru and she boots Riho back before applying a sunset flip for a two count. Rolling leglock by Mitsuru and she puts Riho in a unique submission hold, but she lets go after a moment and goes for a suplex. Riho reverses it into an inside cradle, bridging vertical suplex by Mitsuru but it gets two. Mitsuru charges Riho but Riho avoids her dropkick and rolls her up for a two count. Dropkick by Riho and she puts Mitsuru in a crab hold, but Mitsuru crawls to the ropes to get the break. Riho gets on the second turnbuckle and hits a diving footstomp, she then goes all the way up and hits a second diving footstomp for the three count! Riho wins. I’ll be honest, this was a lot more even than I was expecting. Mitsuru got a fair amount of offense in on the champion as it was a pretty back-and-forth match, and Mitsuru even got a few close calls. While I liked Mitsuru’s submissions, her strikes still need some work as they lacked any impact. Mitsuru shows some promise here, someone to keep an eye on as she continues her career. This is billed as Emi Sakura W’s debut match. I don’t know the backstory of who Emi Sakura W is. I am going to have to turn in my “Joshi Expert” card but I couldn’t find anything on the gimmick, but the person is wearing a wig and a mask. 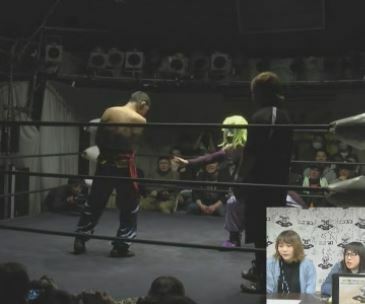 Chon Shiryu wrestles in various small indies around the country, he hasn’t seen much success but has been involved with whatever promotion Emi Sakura runs since the Ice Ribbon days. Sakura W gets the upper hand early on and throws down Shiryu by his hair a few times until Shiryu bails out of the ring to re-group. He returns after a moment, snapmare by Sakura W and he runs around Shiryu before hitting a few rolling sentons. Shiryu avoids the body press however and runs over Sakura W’s face. Shiryu picks up Sakura W and rams him back and forth into the turnbuckles, dropkick by Shiryu and he covers Sakura W for two. Sakura W kicks Shiryu but Shiryu pulls him down by the wig, crossbody by Sakura W in the corner but Shiryu gets his feet up on the Reverse Splash attempt. Shiryu dropkicks Sakura W in the knee and applies La Magistral, but Sakura W kicks out at two. Tilt-a-whirl slam by Sakura W and he puts Shiryu in a Surfboard until Shiryu gets into the ropes. Sakura W applies a double underhook but Shiryu gets away and the two trade chops, Sakura W wins the battle and he hits a double underhook into a backbreaker for two. Sakura W goes to the second turnbuckle but Shiryu gets his feet up on the diving body press attempt, Shiryu goes for a diving footstomp but Sakura W moves out of the way and applies La Magistral for two. Gory Bomb by Shiryu to Sakura W and he puts Sakura W in the Kangaroo Clutch, leading to the submission! Chon Shiryu wins the match. So this was pretty bad, not completely sure why I watched it. I am 99% sure that Sakura W is a man which is why I referred to him as “he” above, can’t see the face of course and the wrestler is in a full costume since Emi Sakura is being imitated, but just going by the body type I think its a guy. Anyway, this was rough, clear miscommunications and whomever was imitating Sakura wasn’t doing it very well, kinda like a Jericho/Super Liger situation where maybe the wrestler is normally good but just didn’t mesh wrestling as someone else. Not sure what it was, but I’d recommend just skipping it. Another Joshi Baby! Aasa has been wrestling for just under a year as she debuted last June, she only wrestles in Gatoh Move so has flown pretty far under the radar. Yoneyama is much better known since she also works with the rookies in Stardom, so this is a very familar position in her to be in. Aasa should get a bit of a chance here as Yoneyama is generally pretty giving when wrestling rookies, we should get to see how she has progressed since we last saw her a few months ago. Aasa attacks Yoneyama right off the start and tries to shoulderblock her over but Yoneyama sends her to the mat instead. Yoneyama throws Aasa down by her hair and knees her in the corner, Yoneyama applies a sleeper but Aasa gets into the ropes. Yoneyama stomps down on Aasa’s back but Aasa blocks the scoop slam and puts Yoneyama in a stretch hold. Yoneyama gets to the ropes for the break, Aasa puts Yoneyama in the ropes and goes to the apron to chop her in the chest. Cover by Aasa, but Yoneyama kicks out. Mongolian Chops by Yoneyama, Aasa hits a lariat but Yoneyama boots her to the mat. More kicks by Yoneyama and she puts Aasa in a crab hold, Yoneyama reverts it into a stretch hold but Aasa gets a hand on the bottom rope. Yoneyama stands on Aasa’s back and puts her in the corner, Irish whip by Yoneyama but Aasa avoids her charge and hits a dropkick. Knees by Yoneyama and they trade elbows, hard elbow by Yoneyama but Aasa hits a trio of body blocks for a two count. Senton by Aasa, she gets on the second turnbuckle but Yoneyama recovers and brings her back down. Sunset flip by Aasa, she tosses Yoneyama to the ropes but Yoneyama blocks it and hits a pair of knees. Running senton by Yoneyama, she goes to the second turnbuckle but Aasa avoids the diving senton. Quick roll-up by Aasa, but it gets a two count. Knee by Yoneyama but Aasa catches her with a Lou Thesz Press for two. Knee to the head by Yoneyama and she hits a running knee to the back of Aasa’s head, but Aasa barely kicks out of the cover. A double wrist armsault also gets a two count, Yoneyama goes up top and she nails the diving senton for the three count! Kaori Yoneyama wins the match. A pretty decent match, considering that Aasa is a rookie. She is a bigger rookie (taller than Yoneyama) which helped her offense look more believable, and Yoneyama gave her a lot of opportunities. Some of it was a bit clunky but the bulk of it was well worked. Not bad but more of an opening-style match than a mid-card match, Yoneyama looked solid though. I have to admit that aside from hopefully the main event, this card is doing nothing for me. Aoi is a Freelancer best known perhaps for her work in Ice Ribbon, while Obihiro has been in Gatoh Move for years while rarely branching out to other promotions. Honda and Hiroshi are both regulars in DDT, it isn’t unusual for DDT wrestlers to be on Gatoh Move cards as they have a good relationship. Aoi is probably the best of these four in-ring, which is a low bar, but hopefully they put together something entertaining. Obihiro and Hiroshi kick things off, hammerlock by Obihiro but Hiroshi gets in the ropes. They tag out, Kizuki and Honda circle each other and trade elbows, knees by Honda but Kizuki dropkicks him. Honda begs off Kizuki and Hiroshi comes in to give him emotional support, Kizuki gets confused and she gets poked in the eyes for her trouble. Honda puts Kizuki in a wristlock and smells her hair, elbows by Honda and he tags in Hiroshi. Hiroshi elbows Kizuki into the corner and tags Honda back in, as they take turns attacking Kizuki. Kizuki finally gets away but Honda stops her from tagging out (slowly and poorly timed), Hiroshi goes up top but he hits Honda by accident while allows Kizuki to make the hot tag. Obihiro goes off on Hiroshi and Honda, she goes to punch Hiroshi but Hiroshi turns the punch back on her and tags in Honda. Backbreaker by Honda to Obihiro and she punches her, but Obihiro knees him low. Hiroshi comes in and sends Obihiro to her knees with just his voice (he is a DDT wrestler, I dunno), but Obihiro recovers and thrusts him in the throat. Kizuki helps by elbowing Honda and they both chop him against the ropes, senton by Kizuki and Obihiro chops Honda in the chest for a two count. Honda suplexes both of them however, he goes to the second turnbuckle but Kizuki grabs him from the apron. Kizuki goes up top and hits a diving crossbody onto Honda, jackknife cover by Obihiro but it gets a two count. Obihiro and Kizuki double team Honda but Hiroshi breaks up the cover, Honda hits a quick backdrop suplex on Obihiro but Kizuki breaks up the cover. Hiroshi and Honda elbow both of their opponents, Hiroshi picks up Kizuki while Honda grabs Obihiro and they both hit Bionic Elbows. Elbow drop by Honda to Obihiro, and he gets the three count! Antonio Honda and Trans-Am ★ Hiroshi win! I won’t pretend this did anything for me, the less said probably the better. I don’t think Hiroshi or Honda are very entertaining, and no one was really taking the match seriously. A pretty low-level match that had very limited redeemable qualities. Please let this match be good so that I didn’t waste two hours of my life. 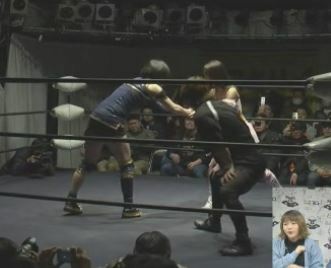 Makoto is the champion in REINA and is their Ace, she actually trained with Emi Sakura in Ice Ribbon so there is still a connection there also. Kotori is the youngest potential star of Gatoh Move, she is only 18 but has been wrestling for four years and has shown a lot of promise. Makoto won the IWA Triple Crown Championship from Riho back in November, so this is Kotori’s chance to bring the title back to Gatoh Move. The champion pushes Kotori into the ropes to start but gives a clean break, Kotori gets Makoto into the ropes next and returns the favor. Wristlock by Makoto but Kotori reverses it, Makoto gets Kotori up on her shoulders and she throws the youngster to the mat. Hard shoulderblock by Makoto but Kotori hits a judo throw and goes for a cross armbreaker. She switches it to a short armbar but Makoto gets out of it, quick cover by Kotori but it gets a two. Makoto applies a seated armbar but Kotori flips out of it, kneelock by Kotori and they end up in the ropes. Makoto throws Kotori into the ropes and stretches her, she picks Kotori up but Kotori elbows her in the chest. Kotori grabs Makoto’s hand and hits a springboard armdrag out of the corner, she charges Makoto but Makoto moves and chops Kotori in the corner. Makoto applies the Tarantula over the top rope (she was also trained by TAJIRI), cover by Makoto back in the ring but it gets a two count. Makoto rolls Kotori to the mat and applies a submission hold, but Kotori gets into the ropes. Makoto throws Kotori into the corner, Makoto flips Kotori out onto the apron and Kotori snaps Makoto’s arm over the top rope. Kotori pulls Makoto out of the ring, she then gets on the apron and jumps down onto Makoto with a plancha. Kotori slides Makoto back in, she gets on the top turnbuckle and hits a diving crossbody for a two count. Kotori charges Makoto but Makoto grabs her by the throat and throws Kotori into the corner. Running shoulder tackle by Makoto, she puts Kotori across the second rope and hits a double knee drop. Big boot by Makoto and she hits a heel drop, cover by Makoto but Kotori bridges out of it. Double underhook bridging suplex by Makoto, but that gets a two count as well. Makoto goes up top but Kotori recovers and joins her, armdragging Makoto to the mat. Dropkick by Kotori, she goes off the ropes but Makoto catches her with a scoop slam. Cartwheel kneedrop by Makoto, she charges Kotori but Kotori slides under her and applies a wing clutch cover for two. Kotori gets Makoto’s back and goes for an Octopus Hold, but Makoto hiptosses out of it. Makoto goes off the ropes but Kotori hits a judo throw, she picks up Makoto and gets a modified grounded Octopus Hold applied, but Makoto gets a toe on the ropes. Kotori picks up Makoto and gets another flash pin for two, she follows that with the Morning Stars but Makoto gets a shoulder up. Kotori goes off the ropes but Makoto does as well and hits a spear. Another spear by Makoto and she levels Kotori with a big boot, cover by Makoto but it only gets two. Makoto picks up Kotori and drops her with a Death Valley Bomb, cover by Makoto and she gets the three count! Makoto is still the champion. Even if this was a high end event, it would be hard to recommend too strongly as the bottom portion of the screen being used to show the commentary is quite distracting and annoying, even if I understood Japanese I don’t know what that really adds to the show. But even not taking that into consideration, this just wasn’t a very good event. Gatoh Move has three really good wrestlers: Emi Sakura, Kotori, and Riho. On this show, Riho was stuck in a rookie match and Emi was MIA, so Kotori was all we had to look forward to. And the main event was a solid match, but the journey to get there was full of sadness and despair. If you get this show, save yourself some trouble and just skip to the main event, trust me.